In many households, the kitchen is the most frequented room. However, if your cabinets aren’t organized, using your kitchen can be difficult and inefficient. If you’ve ever opened a cabinet only to have dishes come tumbling out, or you’re hurting your back digging through messy lower cabinet shelves to find what you need, it might be time to reorganize. If you want to change your kitchen from a disorganized headache into an orderly and efficient dream, there are a lot of organizing tools that can make it easier. Whether you are a die hard DIY-er and want to add the additions yourself or you want to have a contractor do it for you, these upgrades will transform your home. So what are you waiting for? Let’s get cooking! When you have a small kitchen, every inch of floor space is valuable. Don’t let an unsightly trash can take up valuable room! Pull-out trash cans keep your trash out of sight while still making it easy to access. Simply pull on the handle and slide your trash cans out when you need them. Keep the cabinet closed when you don’t. No more tripping over your trash can or worrying about your pet spreading trash around. Don’t you hate when you have to reach to the very back of a shelf in one of your lower cabinets and can’t reach what you’re looking for? Say goodbye to this problem with pull-out shelves. Pull-out shelves make reaching the back of your cabinets easy. Simply open the cabinet and pull out the sliding drawer or shelf and grab whatever you need. Lazy susans are another great option for making everything in your cabinets easy to reach. Rather than pulling them all the way out, however, you simple spin the lazy susan. You can buy small, freestanding lazy susans to organize smaller kitchen objects, or you can install large lazy susans in blind corner cabinets to make the space more usable. Organizing your spices alone can be a pain in the neck to figure out. What do you do with all those small containers? One solution is a door-mount spice rack. 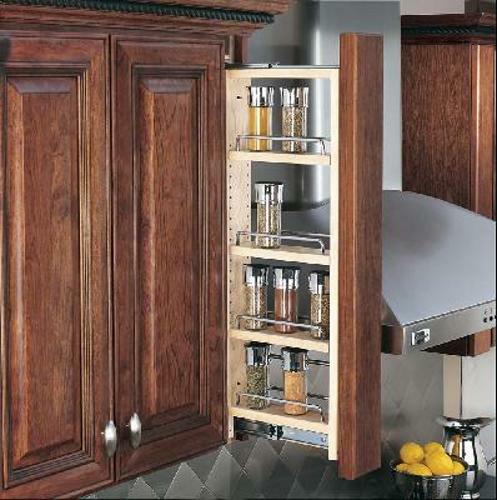 Simply install the rack inside a cabinet door, and fill it up with your spices. This not only makes it convenient to reach your spices, it also frees up extra shelf space. The back of your cabinet doors aren’t just great for storing spices, there is a huge variety of organizational units that turn your cabinet doors into usable space. You can mount a cutting board, install a tray perfect for storing cleaning supplies, or put in a rack that perfectly organizes your tinfoil and plastic wrap. 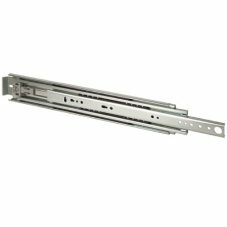 If you are remodeling your kitchen or building a new one, consider adding wall or base cabinet fillers. These organizers cannot be retrofitted to fit existing cabinets, but you’ll want a new kitchen once you see these brilliant organizing additions. These cabinet fillers are the perfect size for storing spices, oil, baking supplies, and other small grocery items. You can also install peg wall organizers that make it easy to hang and store pots, pans, spatulas, and measuring spoons. If you keep your mixer on the counter, it takes up valuable counter space; if you put it in a cabinet, you have to lift up your heavy mixer to the counter every time you want to use it. The solution? A heavy duty mixer lift. Your mixer is hidden in your cabinet when you don’t need it, but with an easy pull of the shelf it lifts up to counter level. Maximize your kitchen storage with a pull-out kitchen pantry. Simply pull out the mounted door to reveal storage baskets or shelves perfect for storing dry goods, cookware, and any other non-perishable food. Stemware is a pain to fit in a cabinet. It is thin at the bottom, but the wide top means it takes up a lot of room. It’s also fragile and prone to breaking. It turns out the best way to store stemware is upside down! Wine and stemware racks turn your wine glasses and stemware on their heads and allow you to hang them underneath your cabinets, freeing up shelf space. Do your baking sheets, cutting boards, and serving platters all sit jumbled together at the bottom of your cabinet? Tray dividers are the perfect solution for decluttering your cabinet and keeping your trays organized. Available in a variety of heights and easy to install, you will never regret this purchase. Upgrade your vegetable and fruit storage with pull-out woven baskets. Not only can woven baskets add organization to a room design, but they also add simplicity, texture, and a European sensibility. These baskets are perfect for storing produce and come with a machine-washable canvas liner. People often say that a clean home is a clean mind. If that's true, then I believe an organized kitchen must mean an organized life! Don’t waste time trying to find your cooking tools in a messy cabinet. Put everything in its place with these amazing cabinet organizers.